This young hero’s journey is highly readable and never short on exciting plot twists. 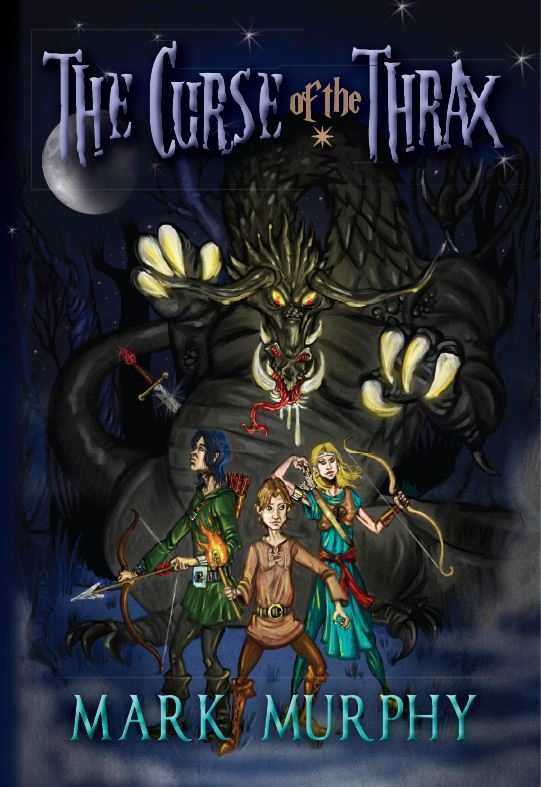 Fast-paced and compelling, Mark Murphy’s The Curse of the Thrax follows a young boy’s rambling quest in a world both mysterious and oddly familiar. It bounces from one exciting scene to the next, pausing only long enough to set the stage for the next adventure. Its original approach and complex themes make it a welcome addition to the genre. The story begins with Jaykriss, born the war chief’s only son. His future is clear and he is proud to follow in his father’s footsteps. One day, while searching for deer with a friend, Jaykriss is chased by the fearsome Thrax, a monster of terrible power. While the boys search for a place to hide, they stumble upon a mysterious old man who tells them of a prophecy that will change their lives forever. Jaykriss and his companions must undertake a dangerous mission to the Dead City, a place known only in legend. Along the way, Jaykriss learns that making the right choice can sometimes come with terrible sacrifices. Can Jaykriss fulfill his destiny and finally grow into his father’s shoes? While the story uses familiar tropes from classic fantasy, it is never short on twists. Set in a mystical distant future, Murphy creates a fascinating reimagining of life after an apocalyptic event. With dragons and other strange beings, it is uncertain how this world has come about. Perhaps most interesting for adult readers is the interaction between magic and science, which is reminiscent of Philip Pullman’s His Dark Materials series. While the moral lessons hidden in the archetypal hero sequence are not new, they are handled well and feel fresh and relevant. The writing is clear and approachable, and it fits well with the content. Murphy uses terms and ideas just complex enough to challenge young readers without making the text inaccessible. He also has a talent for picking out precise details to illustrate his points, though the story would benefit from extra descriptions of the settings to help paint a picture of this strange new world. Although the characters aren’t the most complex, their motivations are clearly shown through balanced and natural dialogue. Jaykriss wrestles with his destiny and social place within his village, but many of the other characters feel one-dimensional. However, as part one of a trilogy, the book does an excellent job of establishing the characters who will become more important in the next installment, and that sense of anticipation about their growing roles is enough to offset any shortcomings. Overall, The Curse of the Thrax is an excellent introduction to a fascinating world and an engaging set of characters. With its subtle social commentary and nonstop action, the novel will appeal to young readers and adults alike.